When we think of pickles in the US, it's mostly the spear along with our sandwich or the slices on a burger. When I was growing up we had two types, sweet and sour. And maybe there were some pickled beets in the fridge that I refused to eat. Little did I know the riches I was missing elsewhere in the world. In Japan, they'll pickle anything that's not moving. All kinds of things are pickled in different ways, creating healthy side dishes that add variety to traditional meals based on rice. If you've never been to Japan, you may have seen a couple of these in restaurants (That pickled ginger with your sushi is one of them). But when you get there, you'll find all kinds of mysterious things on little dishes with your fancy dinner and tucked in your convenience store bento. 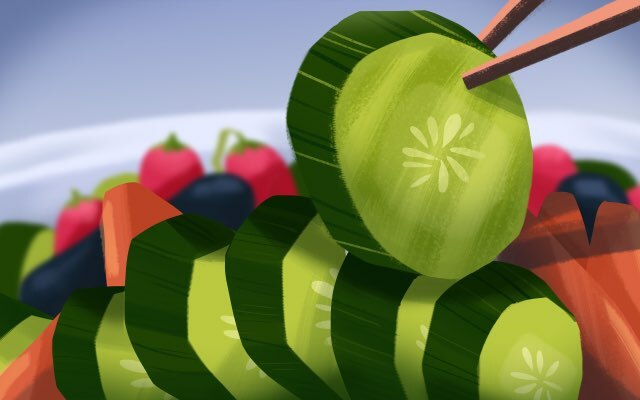 Come along with Tofugu on a journey through the wonderful world of Japanese pickles and find out what all those amazing little tidbits are about. 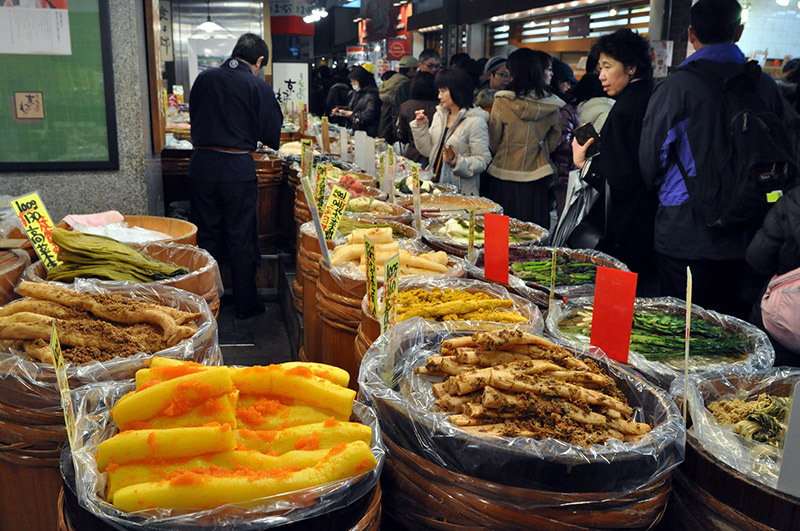 Tsukemono 漬物（つけもの） is the Japanese word for pickles, derived from tsuke "soaked" and mono "things." You'll see that most of the Japanese names for different types end in -zuke, which is the same word as tsuke when it undergoes rendaku in the second part of a compound word. But "soaked" is far from the only way that pickles are made. Yes, some are made in liquids like vinegar, but other methods will probably surprise you. The original and simplest, there are a couple of different ways of making salt pickles. In one method, the vegetables are sprinkled with salt – although the word "sprinkled" may be misleading given how much salt is used – and put in a container. They're covered with a weight or lid that presses down on them, which makes sure the salt penetrates. (Nowadays you can buy plastic containers that come with a pickle press). The salt makes the water content of the vegetables seep out by osmosis, so the container needs regular attention to drain the liquid. Removing the water from the vegetable concentrates the flavor, and with less water, the vegetables are less susceptible to rotting. Salt pickles can take varied length of time. There's a version that you just leave overnight. Another one is measured in months. Pickled plums, for example, are supposed to be left in the salt for the whole rainy season. The longer the pickling time, the more intense the flavors. In the other method, vegetables are put in salt water in an airtight container. As Kikkoman describes it, "in this environment, the enzymes in the ingredients break down the food's components into very different and flavorful substances." That sounds a little scary to me actually but it's nothing compared to our next example…. Rice bran pickles are made by laying vegetables down in a specially prepared bed of rice bran. Boiled salt water is mixed with the bran. Then, similar to sourdough bread, you add some of the bed from an old batch that contains microbes to get the lactic acid fermentation process going. It must be mixed up regularly, traditionally with your bare hands, to keep all the little microbes growing and healthy. I've never had the privilege of getting close to one of these beds (although I've seen them displayed in shops). But The Black Moon says this is how you know when it's ready: "After a week or so the pickling medium should have a heady aroma and look like damp sand." Some rice bran pickling beds have been passed down for generations. It's an astonishing thought in a century where everything in the supermarket has an expiration date printed on it. Like salt pickles, vegetables can be left in briefly or for a long time, up to several months, with different flavor results. Sake lees is the solids left over after sake, which is made from rice, is filtered. 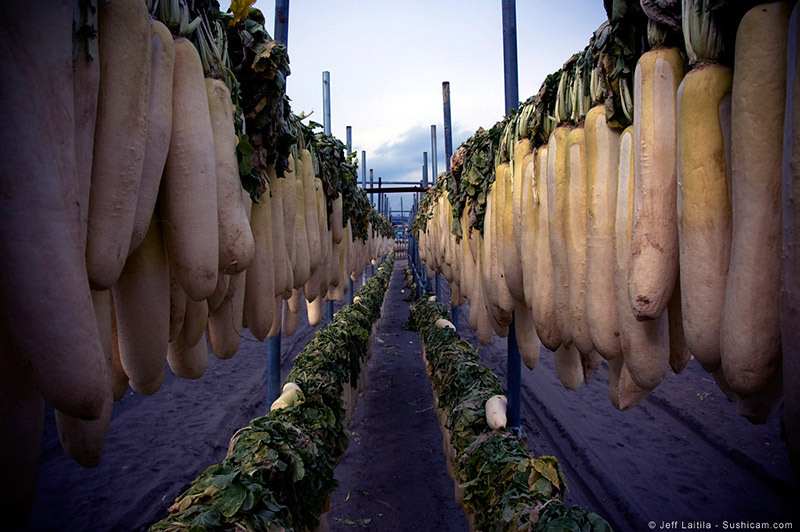 Like rice bran, instead of being discarded, people figured out how to use it to make pickles. Also cured for a variety of lengths of time from a few days to several years, they may actually be slightly alcoholic. Kampai! You probably have never heard of koji, but Japanese food wouldn't exist without it. It's a microbe (let's not call it mold, that sounds so unappetizing!). This little one-celled friend is responsible for soy sauce, miso, and sake, and it's even been proposed that it should be called Japan's National Fungus. Koji is mixed with rice to start the fermentation process that results in those fundamental products. And this koji mash can also be used to make pickles. These are somewhat sweet because koji produces amylase, an enzyme that produces sugar from the starch in rice. Pickles are also made using soy sauce, miso, and vinegar. The most familiar to us, vinegar pickles are not usually for long-term storage. This is because Japanese vinegar is low in acid. I make one regularly with vinegar and a little soy sauce and sugar. Eaten fresh it's more like a little side salad. Leftovers the next day are more pickle-y. What's that? You'd like to try the recipe yourself? No problem. Here it is. Use pickling cucumbers or another type with the minimum of seeds – they have a better texture. If you have to use a regular American cuke, scoop all the seeds out. Slice cucumber and cut slices in quarters or halves. Finely shred some gingerroot. Some of these methods may seem weird to us. In our culture, we think food will spoil if left out of the refrigerator for five minutes. How can it possibly be a good idea to put vegetables in a tub of rice bran and leave them there, at room temperature, sometimes for months? And those pots of rice bran have been passed down for generations! And people mix them with their bare hands! Why aren't people dying of food poisoning left and right? Because these methods actually preserve food: They encourage good microbes, which keep out the bad microbes that make you sick. 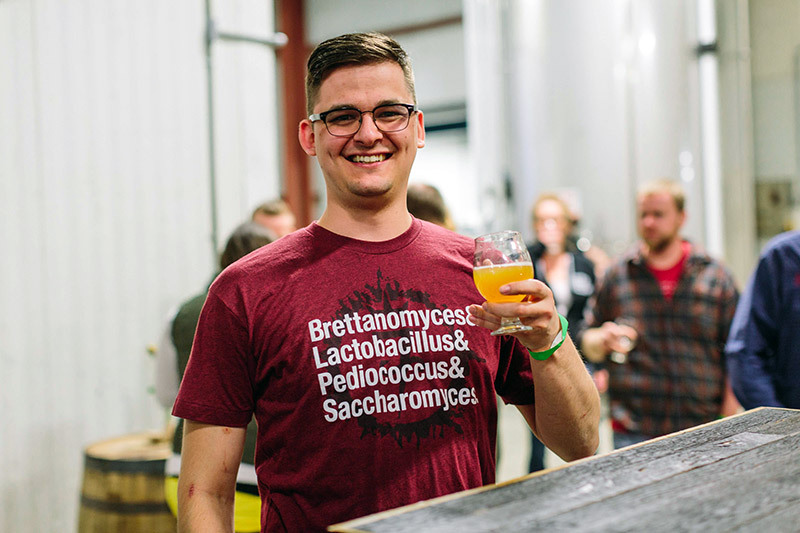 In the US, fermentation is the new cool hipster foodie thing. There's a kombucha bar at my Whole Foods and a stand at my local farmers market selling kimchee and sauerkraut. Maybe we're finally starting to catch up. But Japanese cuisine always been all about the fermentation. As mentioned earlier, miso and soy sauce, both fundamental to Japanese cooking, are produced by fermentation. And aside from those quick vinegar pickles that are more like salads, most of the pickling processes involve fermentation too. Preserving vegetables this way not only made them last longer when there was no refrigeration, some methods even made them healthier. Some types of pickles aid digestion. Rice bran pickles are high in B vitamins – a vitamin that the Japanese diet was short on when it was based mostly on white rice. Rather than throw away the B-vitamin-rich rice bran after it's removed while making the white rice, pickling with it adds these vitamins back into the diet. Japanese people make pickles out of almost every vegetable in so many ways that we could never list all the combinations. There are local specialties and all kinds of ingredients added for flavor. From herbs and citrus fruits to ingredients that add umami like kombu seaweed, bonito, and shiitake mushroom. 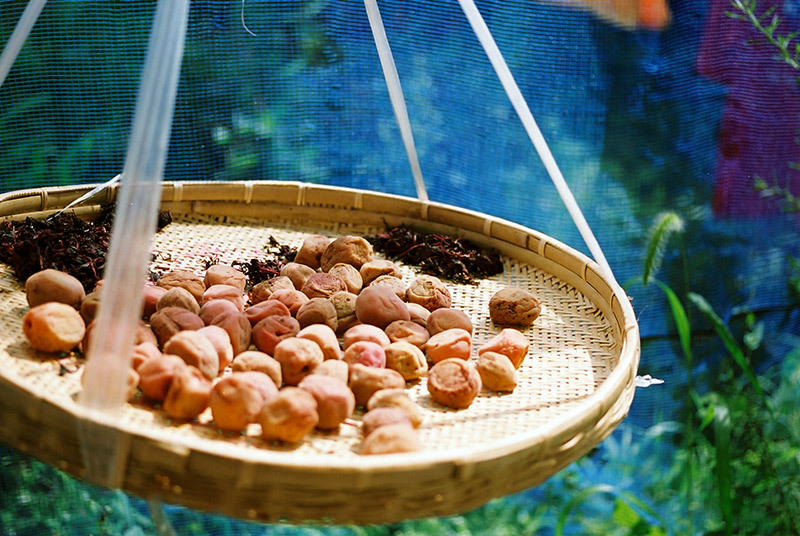 Umeboshi is the Japanese plum, salt-pickled then dried in the sun. They come in a variety of sizes and different textures. They're colored with red shiso (an herb) and are intensely sour. You'll see them in bento and inside onigiri rice balls (careful, because they still have the pit). They're said to have been made for over a thousand years, and to have an antibacterial effect that keeps the other foods in your bento fresh. Gari is the pickled ginger you get with sushi. It's a simple vinegar pickle. And in case you didn't know, you're supposed to eat it between pieces of sushi to cleanse your palate so you can appreciate the different flavors of each kind of fish. Young ginger naturally turns pink when pickled. But the bright pink kind you'll often see is made with artificial dye. 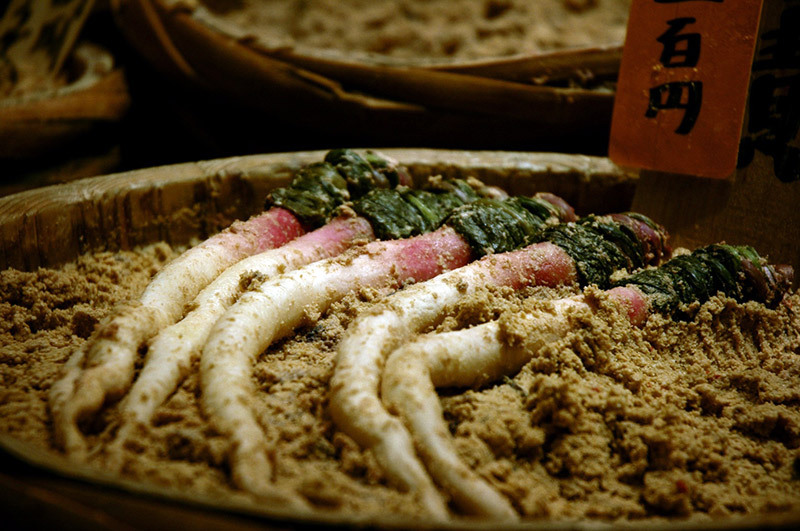 Takuan is rice-bran pickled daikon radish. It's usually served in half-moon slices, and makes a good vegetarian sushi roll filling. Manufactured takuan is also often dyed nowadays, to a bright yellow color. Traditionally it's dried in the sun before being pickled, which can make a pretty awesome photo. Beni shōga is ginger in little red strips. You probably seen these on top of yakisoba or takoyaki. It's pickled in the vinegar used to make umeboshi pickled plums. So its bright red color ought to come from the red shiso leaves. Sadly, today it is also usually artificially dyed. 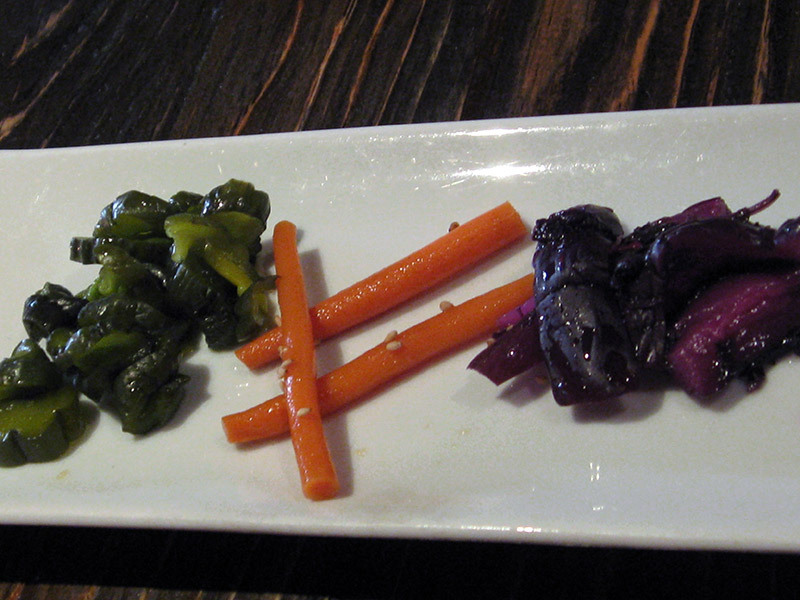 The earliest pickles were vegetables preserved in salt. One legend of the origin of tsukemono places it at Kayatsu Shrine in Nagoya. The shrine is now nicknamed Tsukemono Jinja and home to a festival celebrating the occasion each August. It's said that the local people there traditionally made offerings of salt harvested from the sea and the vegetables from the first harvest. Because the offerings spoiled quickly, someone came up with the idea to combine them together in a barrel. The result was a fermented product, which lasted a longer time. This was considered a gift from the gods, and with good reason. Before refrigeration, and greenhouses, and flying produce all around the world from places where seasons are different, there weren't a lot of vegetables around in the winter. Pickles were the answer. They preserved spring and summer's bounty for the cold time of year. Now we can buy all kinds of fresh produce at any time of year. So they're no longer necessary for providing vitamins and fiber when they're out of season. But Japanese cuisine developed to include them, so a traditional meal doesn't make sense without them. In fact, just rice, soup, and pickles count as a complete traditional Japanese meal. Japanese food is often stereotyped as having delicate, subtle flavors. That may fool you into taking a huge mouthful of pickle, which could be a shock. Think of them more like a condiment. And remember that Japanese cuisine is based around a bowl of rice. Rice is indeed a subtle (some would say bland) food, and there's nothing like a little bit of pickle to kick it up a notch when you take a mouthful of rice. If you watch Japanese cooking shows, you'll often see them taste something and say "this makes me want to eat a lot of rice." That's tsukemono in a nutshell. Oh, and that's supposed to be a good thing. Aside from their flavor, don't forget how important presentation is to Japanese food. Tsukemono in their varied colors add eye appeal as well. Pickles used to be made by hand in each household, and each tasted a little different. Your mom's rice bran pickles really were different from everyone else's, because the microbes on her hands were different. Now, homemade pickles are usually lighter kinds that only take an hour or a day or two to make. Most people go to the store and buy the more labor-intensive kinds. 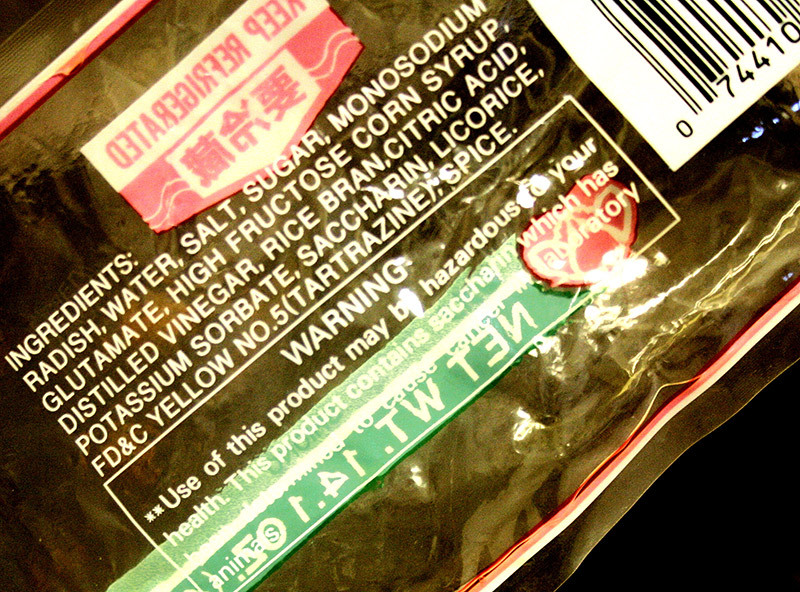 As noted above, manufactured pickles are often made with artificial dyes. Read the ingredients on the packaged ones. You'll find they are about as similar to traditionally made pickles as instant ramen is to a real local ramen shop. Remember that many of these pickles take days or weeks or even months to make in the old-fashioned way. So commercial ones take a lot of shortcuts. 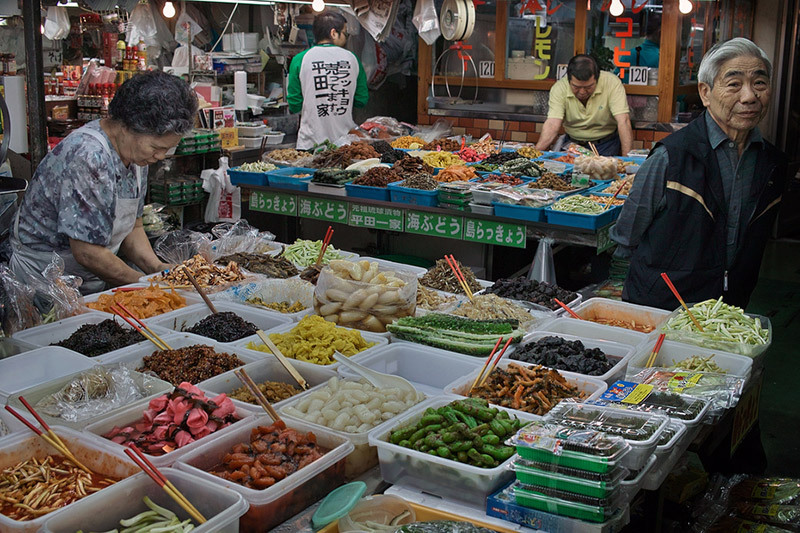 However, you can still find traditional stores specializing in handmade pickles, which may have hundreds of kinds. You should look for them when you're in Japan, because even if you don't buy anything, it's as much a true traditional Japanese sight as any temple or rock garden. Quick and Easy Tsukemono, Ikuko Hisamatsu, Kodansha.